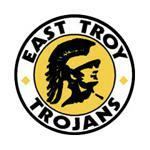 East Troy sophomore Katie Winkler has been selected as the PlayInTheDells.com Athlete of the Week for the week of October 29 through November 4 after a vote on WSN. There was an incredible 6,803 total votes cast this week. Winkler pulled away and won with 2,679 votes, while Pius XI's Ivan Cuellar came in at a close second with 2,542. Katie was an integral part of the Division 2 state champion East Troy volleyball team this year. As just a sophomore, she garnered first team All-Rock Valley honors. In the state tournament last weekend, Winkler had 20 kills, three aces, and six digs as East Troy swept Mosinee in the semi-finals. In the championship, Katie had another 20 kills, two aces, and eight digs as the Trojans swept Kettle Moraine Lutheran to capture gold. The Athlete of the Week is sponsored by PlayInTheDells.com. It highlights the players that have "made a splash" in the world of high school sports each week. If you have a nominee for Athlete of the Week please send it to Colton Wilson.